On November 14, 1965, U.S. soldiers of the 1st Cavalry Division fought with North Vietnamese regulars in the first real battle of the Vietnam War. The odds were 7-1 against the U.S., but with the leadership of (then) Lt. Col. Hal Moore and the air support of the 229th Aviation Battalion, the Battle of Ia Drang was clearly a triumph. 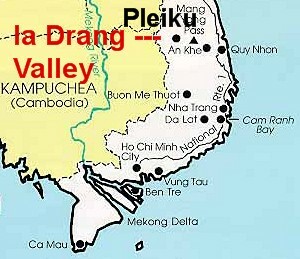 The 1st Cavalry Division had been stationed in the Pleiku province in South Vietnam and given orders to find the enemy and destroy it. At the 1st Cav. 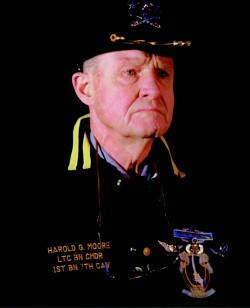 Command Center, Hal Moore had noticed on the tactical map a large North Vietnamese base near the Ia Drang Valley. On November 14, 1965, the 1st Battalion, 7th Regiment of the 1st Cavalry Division (1/7 Cav.) was flown into Landing Zone X-Ray, a clearing in the middle of the Ia Drang Valley. There they fought for three days against the 32nd, 33rd, and 66th Regiments of the People’s Army of Vietnam (PAVN). The enemy was driven back, but without the help of excellent helicopter assistance, very few, if any, Americans would have made it out alive. The Battle of Ia Drang, though it didn’t change the outcome of the Vietnam War much, has changed warfare forever: it tested the idea of helicopter warfare… and proved that it is possible.